Your website, blogs, Facebook, Twitter and other online social media outlets can help you promote fire prevention advocacy messages. These are the media of the present, and they are venues you need to understand and tap into to be successful in the future. Keep in mind these tools are public and they represent your department. Although you can delete items, once they’ve been posted they are essentially a permanent online record. Here are some suggestions to get started. Keep your website working and in good shape. Frequently check your website to make sure data is timely and accurate and that all links work. Regularly place new content online so it will seem fresh as people revisit it. Blogs provide an online platform for regular, comprehensive discourse and another way to share opinions, photos, videos and links. If they are well written, effectively promoted and regularly updated, they can expand your reach and drive traffic to your website. 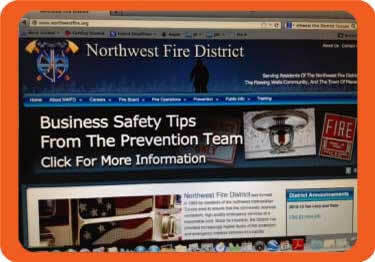 Consider establishing a blog to launch your fire prevention advocacy campaign and update it as you go forward. Using blogs instead of newsletters saves postage and printing costs. You can create a blog site yourself through free online sources, such as www.blogger.com. Facebook can help you connect with people of all ages in your community. It puts a friendly, personal face on your department and gives you an efficient tool to inform and advise the public and to announce news and events. But the real benefit of Facebook is that it facilitates interaction. Use it to post photos, stories of recent events, videos and links to organizations, agencies and those who have inspiring stories; but also use your Facebook page to post questions and to otherwise engage your audience in a virtual conversation about fire prevention. Familiarize yourself with Facebook Apps so you can fully utilize all that is available to you. If you establish a page, start by visiting Facebook’s nonprofit advice. Tip: Again, less is more. Too frequent posting may result in fans dropping your Facebook page or blocking your posts. Twitter’s popularity is growing. This site allows you to post a message that is 140 characters or less (characters = letters plus spaces). You may find it useful to post brief comments and links to your photos, videos, website and to tweet about other agencies and organizations. Through your tweets, retweets and mentions, you can grow your Twitter followers and help drive Facebook fans, blog readers and traffic on your website. Twitter Apps make it easier to upload photos, videos and Web links. Learn more about Twitter. Tip: Learn how to synchronize your Twitter and Facebook accounts. Using them together helps to build followers and fans. There are many worthwhile online resources to help you reach out through social media. Nonprofit Tech for Good is one resource to consider, available at no charge. Tip: Protect your department’s social media passwords, just as you would protect your personal email and online accounts. Americans are increasingly using mobile devices and there is a noticeable shift toward increased use of social media in emergency organizations and agencies. According to an American Red Cross survey, 76 percent of respondents expect help in three hours or less after posting a request on a social media site. Forty percent said they would use social media to tell others they are safe. In March 2009, the city of Madison, Wisconsin, passed a new residential smoke alarm ordinance following five residential fire deaths in the previous year. To help the public understand both the dangers of fire and the importance of adequate smoke alarm protection, the city posted information online.